Mix and Chic: Christmas decor around our home! I have been very late to the Christmas decorating party, I know. I wasn't ready to decorate my home for the holidays initially because my goal is to finish decorating the master bedroom first before everything else. Since we wanted hardwood floors for our master bedroom, we are still shopping for the right kind of flooring. The selection process is not easy because my taste and my husband's are so vastly different (he thinks honey oak floors are wonderful and there's nothing wrong with it). Not that there is something wrong with honey oak floors, I just prefer ebony/ dark chocolate brown wood floors for a more seamless look. The ironic thing is, our home is covered in these flooring. Yes, we can always restain them but it is not going to happen anytime soon because it is out of our budget. So, at the mean time, while blog hopping and looking for holiday decorating inspirations for my blog, I felt so inspired by all the gorgeous Christmas decorations that I decided to go for it. And so, here is it! Before we look at some holiday decor pictures, let's check out my super duper easy makeover with my preserved boxwood. I got each one for $13.90 each at Meijer, which is a total steal. On average, this sells for over $30. I saw similar ones at Restoration Hardware for $50 each and $20 each at Home Goods. There is a reason I got such a great deal. As usual, while grocery shopping at Meijer every weekends, I love to browse at their selection of greenery and flowers. One day I spotted these. I have a habit of checking out the price for everything, okay, not everything, just mostly things I love. I looked everywhere even the bottom of the pot but I found no price tag. I went to one of the employees and it took about 10 minutes before one of them decided each one of this gorgeous preserved boxwood sells for $13.90. I was so happy when I heard that, I actually bought three of them. I only used a pair for my Christmas decor. This is how it looks when I first got it. It's very similar to the Restoration Hardware version, isn't it? I plan to put it on my fireplace mantel but it would blend too much with the stone. I always like a good contrast when it comes to decorating. So, I decided to get another vase to put it in. I went to Ikea and found this fabulous vase for just $2.99 each. (I bought a pair of red ones for the holidays and a pair of white ones for regular days) Gotta love Ikea for their amazing prices! It fits perfectly, but do you see anything wrong with this picture? Yup, you still get a glimpse of the original flower pot and it doesn't look that great! It's time for improvisation! My first thought is to get a ribbon to tie around the two flower pots to hide the "flaws". And how festive is this ribbon? I got it from Michael's for just $1.90 during their pre-holiday sales. Unfortunately, it wasn't like regular ribbon, it was like those plasticky, disposible table cloth material. It was a tricky material to work with. Let's just say it took me 10 minutes to tie a somewhat presentable bow. (You can see a little wrinkle on the bow if you look closely enough, I don't remember how many times I tied and untied that bow, urgh! Anyway, ta-dah! The final look I was looking for! Now, let's check out some holiday decor around my home. Oh, by the way, I switched my "stand-ins" fashion prints for a white faux deer head. I know many people like those prints, I love them too but I don't think they are ideal for the fireplace. For your convenience, I will include a picture before the switch to refresh your memory. You can read more about it here. I always thought the ideal object to hang on my stone fireplace is either a mirror or a deer head. I have been wanting one of these deer heads since I first saw them at Z Gallerie a while ago. But I am not ready to part with $250 for this. So, I waited till the Thanksgiving sale and I got it for 20% off. The total is $200 plus tax. These large white lacquer deer heads are now on sale for $200, so grab it while it lasts. There is a whole collection of these faux animal heads at Z Gallerie but I picked this one because I love the sculptural look of the antlers and the scale is right for my fireplace! Have fun viewing the pictures! Our Christmas tree during the day. Our Christmas tree during the night. Do you like my holiday decor? I hope you enjoy this little tour of my living room during the Christmas season. Truth to be told, this is actually the first year that I go "all out" with the Christmas decorations. I have been collecting the ornaments and holiday decor over the years, though. Next year, I plan to decorate my dining area with a nice table setting for the holiday season. Do you have any last minute Christmas decorations to share as well? I would love to see it! By the way, I am linking this post to Cottage & Vine. I hope you have fun checking out other fun and beautiful holiday tours, too. You have such a beautiful home...love the holiday decor! have a great christmas! You have created a welcoming festive space. Wishing you the joys of Christmas and may 2012 be your best ever. Thank you for your friendship, support and comments. Love those Crate & Barrel stockings, I have the green ones too! :) Gorgeous decorations, hope your holidays are merry! Love your mantel and your tree, Jessie! It may be last minute, but everything looks wonderful! I love the white deer head! Your tree is beautiful too. Looks like you're ready for Christmas! Hope it's wonderful, Jessie! I love your festive decorations, Jessie, you've done a beautiful job! Thank you for all the amazing inspiration on your blog. Have a wonderful, fun Christmas and New Year! Beautiful decorations. Really love your white tree. Thanks for sharing. Jessie, beautiful mantle decor and gorgeous tree. I love how you dressed up the boxwood. Have a great Christmas weekend! the decoration its fabulous !! It all looks so wonderful! Merry Christmas, Jessie. I hope you have a great one! M.
Jessie, my mom and dad had a tree like that. My mom had a light that went around and flashed different colors on our tree. you brought back some sweet memories. It's lovely, Jessie! I love boxwood anything. Wishing you a very Merry Christmas! Oh wow! I am crazy over your mantel! Thanks so much for joining the party! The deer head looks awesome, I love it! Your Holliday decor looks so pretty too, you did a great job! You've done a fantastic job! Very festive!! your home looks gorgeous! i love those fun stockings! Your holiday decor is so pretty Jessie!! 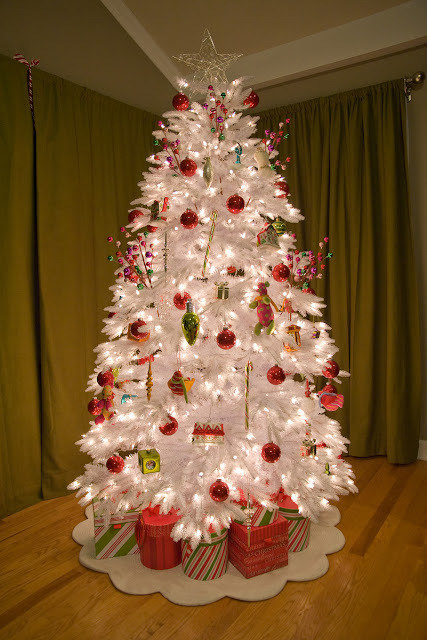 I love your gorgeous white tree. Those little boxwoods you got are so cute! What a great idea, putting them in the Ikea vases, and the ribbon tied around the top is perfect! There's nothing more excited than finding something like that at such a steal! Oh and I have to say I totally agree with you about the floors. I want super dark wood floors too. I think they look so seamless and ground everything. I LOVE your white faux deer head above the mantel! It works so well with the Christmas theme that you have going on in your pictures! It almost looks like a reindeer! So fun! I love it! We have the same deer head over our living room fireplace! It' even on my blog header, I love it so much! We also snagged it while it was (so briefly) on sale.